March means college basketball to those who love the sport. And in Vegas, the gambling types will be ​betting the on winners of the NCAA tournament brackets. Most casino sports books will have big-screen televisions (and multiple, at that) for your viewing pleasure, as the vibrant casino setting allows for a festive atmosphere on game days. But if you're not into betting and just need court-side snacks and libations, hit up a high-end sports bar instead for gourmet bar food and craft beer. Here are some great places to hang out during March Madness. Lagasse's Stadium is the ultimate sports bar with giant screens (and 100 small screens) surrounding the entire restaurant. And a sports book is just steps away from your seat. The food is great—typical of any Emeril Lagasse venue—and the beer comes in large quantities. If you're up for a long day of watching college basketball, this is as good a spot as any. VIP private suites are available, as well as gourmet bar food like mini barbecue pork sliders, smoked mushroom and goat cheese dumplings, and bacon-wrapped scallops. Pull up a seat in the beer garden at Umami Burger at the SLS Las Vegas Hotel and Casino. This ultimate viewing venue has over 50 televisions and plenty of beer to go around. And the food isn't your typical "wings and fries" bar food, either. Named GQ Magazine's "Burger of the Year" Umami burgers are made with premium ground steak and decorated in signature sauces. 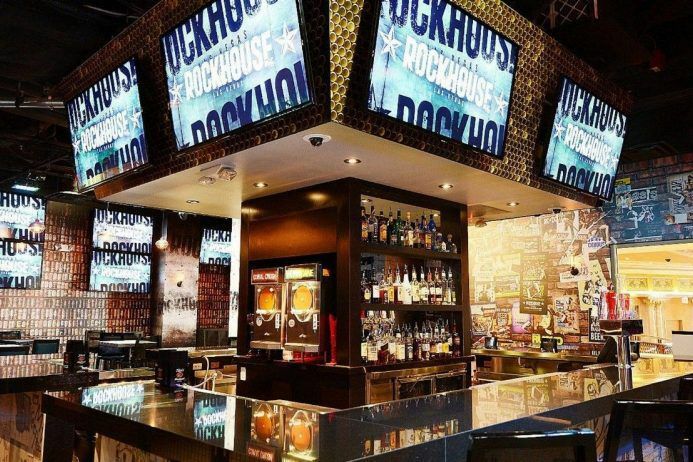 Take in the March Madness atmosphere, complete with gourmet food, craft beer served in an outdoor garden and betting at the adjacent Will Hill Sports Book. Basketball takes center stage at the LINQ Promenade's open-air entertainment venue with jumbo screens on a fountain-clad stage. While watching non-stop NCAA tournament action, fans can enjoy drink specials, games, and prizes throughout the weekend. Check out eateries and bars like 3535, the Catalyst Bar, and Off the Strip, while family members more inclined to shopping peruse designer boutiques. AmeriCAN (also on the LINQ Promenade) hosts March Mayhem, a tournament-long viewing party, complete with premier seating both inside and out on the patio. Full and half-day open bar packages include their menu lineup of over 70 canned beers, representative of each of the 50 states. Reserve your seat at the bar to make sure you don't miss the mayhem. Caesars Palace invites fans into their large Forum Ballroom for a basketball party that consists of massive amounts of food and plenty to drink. March Madness packages include an all-you-can-eat premium buffet, an open beer bar, broadcasts of games in all four regions, giveaways, and live betting tables. You'll also find drink specials at the casino's Race and Sports Book Bar, Slice Bar, Seahorse Lounge, Lobby Bar, and Spanish Steps. The Mezzanine at Planet Hollywood is also a great place to catch the basketball action. And—similar to Hoops on the Strip—their Celebrity Ballroom tournament party goes big by broadcasting games in all four regions, complete with an open beer bar, an all-you-can-eat buffet, live betting stations, and giveaways by models. The Tilted Kilt does March Madness justice in the traditional Irish style. During the tournament, enjoy the Guinness beer of the month and Celtic fare, including corned beef hash. Wear your favorite team's jersey to win prizes like a free entree, a discounted bill, and coupons for the Tilted Kilt retail store. Voted "The Best-Looking Sports Pub You've Ever Seen," this bar and its scantily clad servers may distract you from the actual game. March Madness goes outdoors at Rhumbar with drink specials throughout the tournament, from the first to the final game. Rhumbar provides basketball fans with multiple high-definition televisions and prime patio seating to create the perfect outdoor atmosphere. Single-day party packages, as well as four-day tailgate packages, include unlimited mixed drinks and tasty tailgate fare.